UPDATE: WE GAVE THIS TO A FAMILY IN NEED ON FRIDAY, MAY 17. IF YOU HAVE SOMETHING YOU NEED OR SOMETHING YOU CAN GIVE, CLICK ON CONTACT THE PUBLISHER ON THE HOME PAGE TO GET IT ONTO THIS SITE. $50. 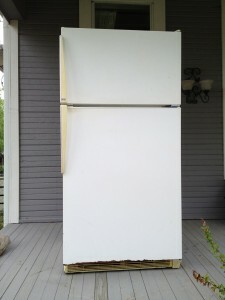 It’s an Amana model with a top freezer. Kind of fancy for it’s day. It came with the house. 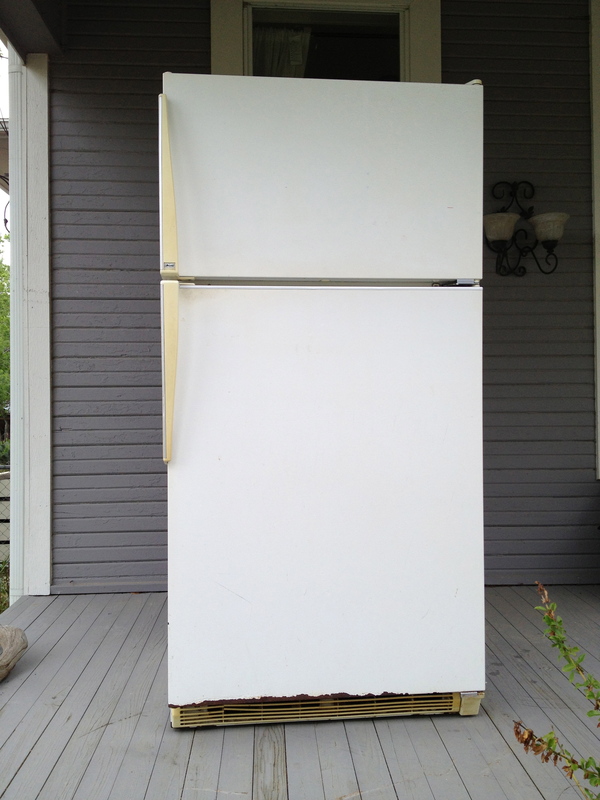 It has worked fine for the past year but we were given a newer fridge so this can go to a new home. It should probably get a new gasket but we never bothered. They run about $42 bucks on Amazon, based on a quick check. Sold as is. Needs a cleaning but it’s not gross or anything like that. There is a bit of rust on the bottom of the door. A little sanding and a little appliance paint would fix that up real quick. It has an ice maker but we don’t know for sure that it works because we don’t have a working water outlet by the fridge. Call Stewart at 512-557-3512 if you are interested. This entry was posted in For Sale, Sharing & Trading on May 6, 2013 by Stewart Dale Spencer.